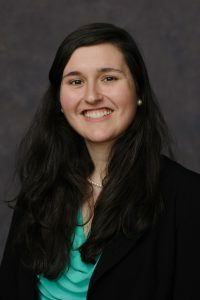 Former UA MBA Student (and current University of Michigan medical student) Ruth Bishop also chose The University of Alabama for undergraduate study, majoring in Spanish and biology. Bishop was one of the first participants in the STEM path of the University’s MBA program and is a recent Fulbright Scholar, which has helped shape her professional path. How do you plan to use both your MBA and your medical school experience? Bishop was one of the first participants in the STEM path of the University’s MBA program and is a recent Fulbright Scholar, which has helped shape her professional path. I am interested in understanding how to provide better care to underserved populations, and I think business is more sustainable than a nonprofit in providing quality care in terms of being able to see patients and not turn them away. I wanted to learn how business would allow me to make processes more efficient. That way I could subsidize the cost of care so a practice could see a variety of patients. What do you hope to do once you complete medical school? I’m at the University of Michigan in my first year of medical school. I’m bilingual in Spanish, and that’s a passion of mine – making sure patients who are undocumented have access to care. I’m thinking of primary care or pediatrics at this point, but I’m also open to other things. I was very lucky to travel to India and participate in the Reverse Innovation course (a summer study abroad course taught by Dr. Robert Morgan that involved spending one month in India) that has been influential in my thinking on the impact of business on healthcare and how to care for people in underserved or rural areas through efficient practices. Replicating what I learned in that course appeals to me. What was your Fulbright experience like? During my Fulbright year I was working as an English teacher in a university in Medellin, Colombia. As an assistant, I helped with college students and conversation clubs. I also led a storytelling project, similar to Humans of New York, with students talking to people who were street workers or people they knew personally. We even had a little exhibition in the library with the students’ work. While I was there, I was able to take Spanish classes and further mastering the language. I also volunteered with a local nonprofit, E2E, an urban garden project that facilitates space for urban gardeners to produce vegetables sold to local restaurants. How did that year affect you? I cannot recommend Fulbright enough. It was one of the best years of my life. I met some amazing people and got to travel to the most amazing country in the world. It has given me more global perspective on healthcare and how different social factors contribute to health. The communities we worked with had a lot of challenges regarding access to healthcare; environmental factors like access to clean water or green spaces; and interpersonal or gang violence. These widened the scope of things to think about in life and in healthcare. How did the faculty at UA support your graduate or Fulbright experience? The faculty and staff were very supportive in writing recommendation letters and guiding the Fulbright application process. UA was excellent in helping me with my essay and walking me through the process so I would be competitive. I had established relationships with faculty that helped a lot. I never had a professor say no – they’re very responsive and helpful. Why should a prospective student choose graduate school at UA? I think Alabama has a lot of different opportunities for funding, and that’s important. There are a lot of professors doing really awesome things in the community and abroad and in terms of technical research. There are a lot of things to be involved in at Alabama, and that’s a strength. Generally, people are very helpful and kind and want to help you succeed. They can help you meet your goals if you’re transparent in expressing them. What advice do you have for other prospective or current graduate students? Look for mentors early and be intentional in your relationships and conversations with faculty. Sometimes we think they’re really busy or not interested, but most of them want to be involved with your career. Recognize that if they offer to meet with you, and take the time to meet with them. Do your part to invest in the relationship and that can go a long way.